Compact hatchback segment is surely the most popular, crowded and also the competitive segment in Indian automobile market. Indians love small cars. We want maximum out of the compact small boxes called hatchbacks. In the growing competitive segment, Nissan Micra tried to bring some fresh air around half a decade ago. Now with so many competitors and fresh designs around it, the Nissan Micra is all due for a major change. Now that the car is finally unveiled infront of the public we are pretty sure that it will definitely turn some heads. This new hatchback is wider, and longer than its predecessor which definitely has resulted in more interior space as well. The hatchback also gets a completely new drivetrain and also an agile chassis. The Nissan Micra hatchback looks pretty much the same as it was before. The egg-shaped styling continues to be part of the front façade. The boomerang-shaped bulgy headlamps blending with the bulgy bonnet makes the car look cool. The headlamps cluster also incorporates follow me Lights. The vehicle poses the same bolder aggressive looks with the v-shaped grille in line with the carmaker’s current design theme while the air dam is flanked by triangular breaks for the lamps. At the sides, the car now gets ORVM turn indicators while it continues to sit on 8-spoke 15-inch alloy wheels. The CVT variant poses distinct look with the blacked out roof and a racing strip running down the length of the car. The alteration at the rear is also subtle with the new rear spoiler adding a dash of style. The car continues to sport the LED tail lights with the boot lid flowing perfectly into the rear bumper. Over the years, the interiors have been refined a lot. The dashboard of the car is well laid out. The Micra has replaced the older dull looking grey scheme with more chrome across the cabin. The car now boasts of all black interiors which has certainly uplifted the premiumness inside. The center console which earlier got chrome treatment has been revamped once again. It now features a new 6.2 inch touchscreen infotainment unit with audio video navigation through phone mirroring. The car, as usual, continues to sport the same set of seat fabrics and trims. The rounded air con control and the top half of the dashboard remain the same with piano black finish which is delightful to feast your eyes on. The steering also remains intact with chrome studded company logo which does make the car feel more upmarket. In terms of space, the front passengers get plenty of it and there is a sufficient amount of clearing between the driver’s knee and the steering. Where headroom is good at both front and the back, the legroom at the rear is absolutely generous and amongst the best in its class. The automatic air conditioner scores some brownie points when it comes to chilling the compartment. Other comfort features in the car include rain sensing wipers, lead me to car for tracking the car in parking, electrically adjustable ORVM, automatic headlamps, driver seat height adjustment, push engine start/stop and remote keyless entry. Presently the Nissan Micra gets power from a 1.2 litre DOHC petrol unit mated to a 5 speed manual transmission churning out 76 PS peak power. On the diesel front the Micra comes with a 1.5 litre SOHC unit under the hood paired with 5 speed manual transmission and produces 64 PS peak power.Compared to a conventional continuously variable transmission (CVT) system, X-TRONIC CVT transmission offers fewer shift shocks and smoother acceleration said a company release. With a mileage of 19.34 kmpl (as per ARAI), the Micra’s fuel efficiency puts it in competition with many manual cars. The Micra has a heritage spanning over 35 years and is currently in its fourth generation. The first generation was launched in 1982 as the Nissan March in Japan. The name, which was selected from through a public poll was later changed to Micra, derived from the word ‘micro’. It was the first locally produced Nissan model in India with production starting in 2010. It is also one of the most exported cars from India. 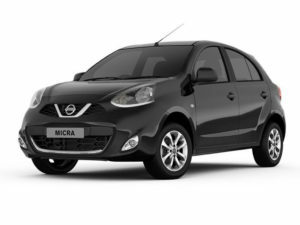 On the performance front, the Nissan Micra 2018 specifications notice no change as it continues to feature the same petrol and diesel engines as the preceding model. Similarly, there is no change in the transmission options and hence there is no change in its handling as well.In terms of ride and handling, the car remains conservative. The suspension set-up is slightly stiffened, may be to handle the additional weight of the diesel engine. The car moderately tackles the ruts and dents on the roads quite moderately. While the suspension remains silent, the medium sized potholes do not bump through and the ride feels busy. Nissan Micra’s braking ability is moderate and the car stops in the straight line without any problem. This time around, the carmaker has upped the safety aspects. The new Nissan Micra comes with standard dual front airbags and rear parking sensors. Other variants include features such as Brake Assist, ABS with EBD, engine immobilizer, rear parking camera, central locking, rear wiper, automatic headlamps and rain sensing wipers. The vehicle also comes with aspects such as traffic sign recognition, intelligent lane intervention, speed warning device, high beam assist, intelligent emergency braking and blind spot warning. Nissan Micra On-Road Price in Hyderabad ranges from 6,95,297 to 8,55,022 for variants Micra XL CVT and Micra DCI XL Comfort respectively. Nissan Micra is available in 5 variants and 6 colours. Below are details of Nissan Micra variants price in Hyderabad. Check for Micra price in Hyderabad at Tryaldrive. The all new generation Micra will arrive in European showrooms by March 2017 and offcours! It will also make its grand entry into the Indian market as well by the 2017 end or early 2018. The new Micra definitely is a revolutionary car which will help carry the Micra barnd forward which has been here for the past 30 years or so.The tweaks to 2018 Nissan Micra are strictly restricted to features update. While the dual airbags are now standard across the range, the ABS and EBD are missing in the base trim. Overall, it is now a better package than before.